This is one of two scooters we’re currently working on for long-time RLC customer Paul Calder. 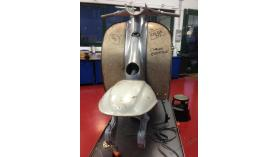 This is a Lambretta Tv175 Series 2 model that will be a real bling-king once done. Paul and RLC’s Marco have worked on a colour scheme that is amazing and with all the period accessories that Paul has in his collection, this should be a real show stopper. We have stripped the base scooter, a Greek import TV2, and had it blasted and primered. The bodywork is now being dry built and all the accessories bolted on. The engine is nearly complete and this machine has a MOUNTAIN of NOS parts - both inside the motor and with regards to the bodywork itself, which is 99% NOS. More info and pics to follow shortly.